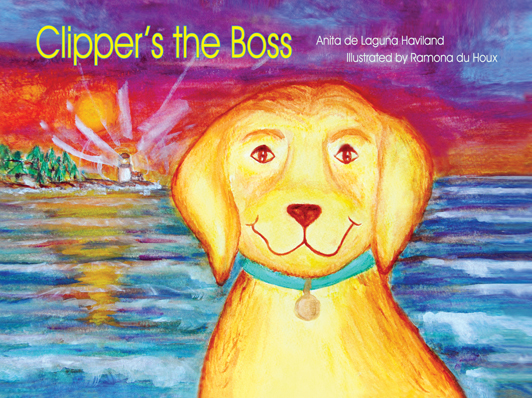 Clipper, the island puppy, ABC book in 4 languages makes news! The article in Maine Insights: A Maine vibrant watercolor ABC book in four languages under one cover. The article is also in the Bangor Daily News, HERE. Finally, there is a children’s ABC book with watercolors of Maine in four languages! 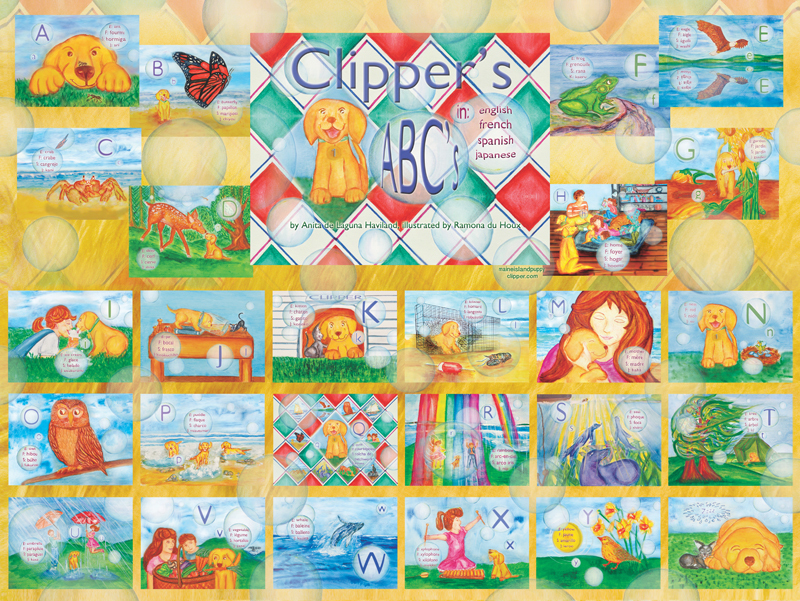 Clipper’s ABC’s in four languages is now available as a 18 x 24 inch poster to put on any child’s wall. 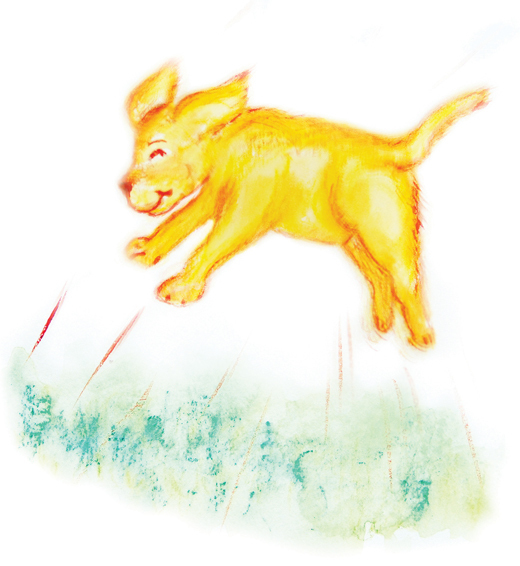 The bright playful puppy not only will help teach your child their ABC’s but he’ll also take them on a journey around the world by translating words from English to French, Spanish and Japanese. The poster is only $18 including shipping and handling. Please use paypal at duhoux2@tds.net or send a check or money order to: Polar Bear & Co., PO Box 311, Solon, Maine., 04979. Any Maine school can have the poster free. Any teacher purchasing 2 or more Clipper Books can receive a free poster! The poster can also be purchased framed in oak for $42 plus $5 shipping and handling. It looks great in any child’s room or school. Finally, a children’s book in four languages! Here is an example of some of the playful, educational pages in Clipper’s ABC’s, plus the front and back. 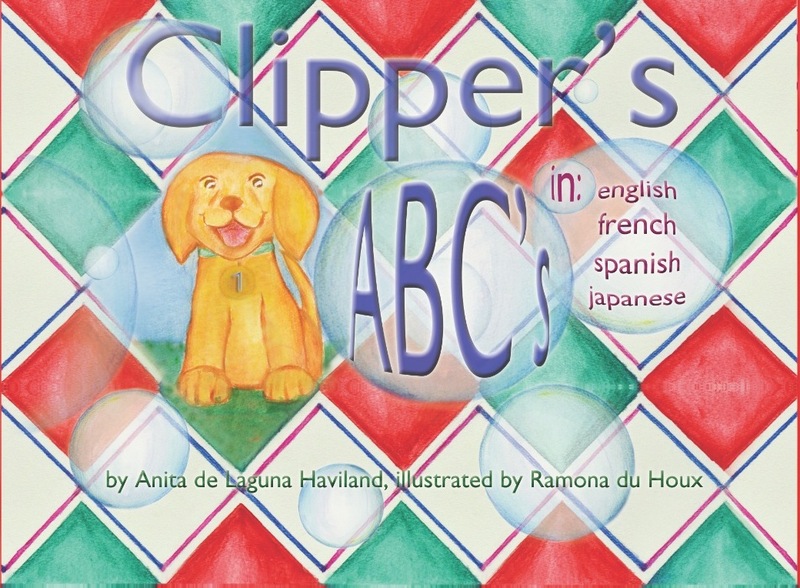 Journey with Clipper, the adorable Maine island puppy, as he takes children into his world, while teaching them their ABC’s in English, French, Spanish, and Japanese. 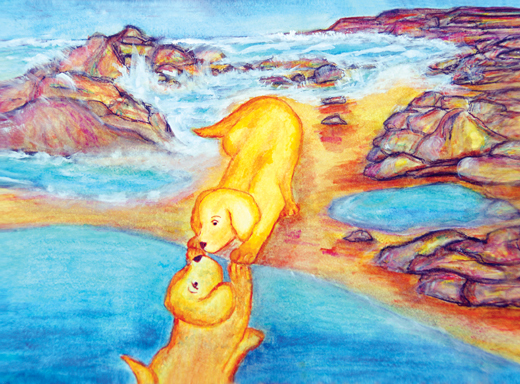 One painting leads into the next, as children follow bubbles throughout the book. This unique concept gives children continuity, as they discover other languages. 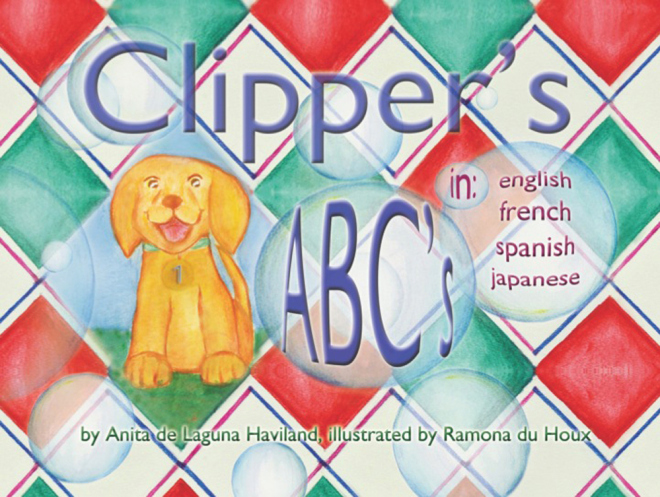 Reading Clipper’s ABC’s in English, French, Spanish, and Japanese children and adults fall in love with the puppy in the different circumstances the artist, Ramona du Houx, depicts him in. Some are humorous, some serious. 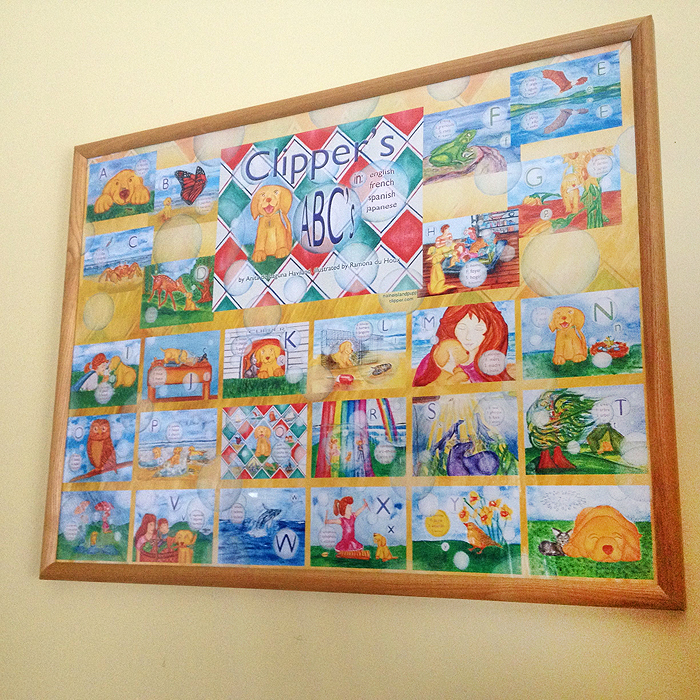 Children eagerly try to pronounce the different words, as if Clipper has given them the courage to do so. Clipper takes them into his world, while teaching them their ABC’s. Place your order now. Send a check or money order for $17.95 + $3 for shipping and handling. Order saying you read about the book here and receive free shipping in the U.S.A. See above ordering details. Watercolor painting illustrations copyright © 2014 by Ramona du Houx. Clipper copyright © by Anita de Laguna Haviland. All rights reserved. Hi! I’m Clipper. Did you come to play today? Be careful, we have a ghost on the front porch. Not a real one, but a huge pumpkin carved to look like one. I am sorry to be so late, but a lot has been happening this month at my house! How about at your’s? Marie dressed me up as a clown for her kindergarten class Halloween party, and I don’t like it one bit! Puff was left alone because she is so tiny that she can’t go to Marie’s Halloween Party today. So I am going as a baby clown in Marie’s dolly buggy. She’s giving me treats to do it, so I guess I am a baby puppy clown! Clipper is a sweet Labrador puppy who loves to get into mischief. Through his adventures on a Maine island we all “grow up” with this adorable puppy as he warms our hearts and souls. 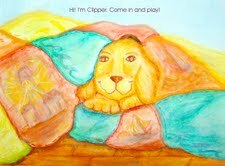 Join us on Clipper’s journey of life as he overcomes problems and obstacles every child goes through. This blog serves as a way to share ideas and create a dialogue about growing up in Maine. Please let us know if you would like a signed copy or line up a book signing or reading! Place your order now. Send a check or money order for $17.95 to the publisher at: Polar Bear and Company, P.O. Box 311, Solon, Maine., 04979. Or call 207.643.2795. Order saying you read about the book here and receive free shipping in the Continental U.S.A.
Marie is trying to teach me how to read, and puppies don’t read! It is perplexing, figuring out how to tell her. Maybe if I just went to sleep she would understand. Her voice makes me want to sleep. I think my idea was the right one because when I woke up she was smiling at me and reading her new ABC book! It has pictures of us both in it! That is very exciting. I love seeing pictures of me and the family.